Do not separate James Haskins into multiple authors unless you are certain this is correct. 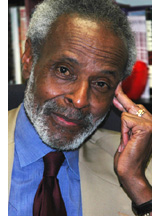 James Haskins (often Jim Haskins), an educator in New York City and Florida, wrote more than 100 books on subjects as diverse as African-American history, child abuse, alcoholism, werewolves, street gangs, religions, Indian history, sports and music biographies, and the Count Your Way series. The academic site listed in the sidebar has a large list of his many books. James Haskins is currently considered a "single author." If one or more works are by a distinct, homonymous authors, go ahead and split the author. James Haskins is composed of 5 names. You can examine and separate out names.